Petit Design Co: EQ7 coming soon! Have you heard that the new version of Electric Quilt is coming out May 31st? I haven't decided yet if I'm going to upgrade or not. I have really enjoyed my EQ6 and this new EQ7 has some nifty features. The very best feature, in my opinion, is the new activation policy. It used to be that you could only activate EQ up to 3 times. This meant that you could put EQ on 3 different computers. it also meant that if one of your computers died it used up one of your activations! Now you can activate and deactivate EQ7 as many times as you like! This means that you can install it and not have to worry about what will happen if your computer dies or if you sell off your computer. I am also excited about the new Shrink and Flip feature. You can use it to make new blocks taking an existing block and rotating however you like. Do you own a version of EQ? Do you like it? Will you upgrade? I have EQ5. I like it..but I probably won't upgrade. I have EQ5 and never got 6 because of that activation policy. 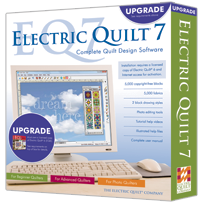 I have already pre-ordered the full version of EQ7 (it was almost the same cost as upgrading from 5 to 7) and can hardly wait to play! hace unos días pensaba en que tener un programa para hacer quilts debe ayudar muchísimo... eso es EQ 7? y si tu ya tienes uno, qué opinas, vale la pena comprarlo? es fácil de usar? tal vez luego busque uno, no se, supongo que podré comprarlo vía internet, porque acá definitivamente no creo que los vendan.. un abrazo y feliz cumpleaños!!! !